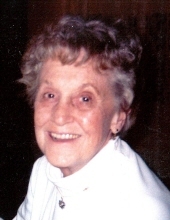 Betty Gray, 89, of Davenport passed away peacefully with her family by her side at her daughter’s home in Davenport. Graveside services will be 1 p.m. Tuesday at Rock Island National Cemetery, Arsenal Island. Quad-Cities Cremation Center is assisting the family with arrangements. Anyone wishing to attend the graveside service may meet at TGI Friday's parking lot at 12:30 p.m. In lieu of flowers, memorials can be made to the family. Betty was born Sept. 24, 1927, in Davenport, to George and Bertha Lousse Schwerdtfeger. Betty was a truly gifted housewife in every sense. She enjoyed baking, cooking and cleaning. Her home and family was her everything. Betty met her husband, Thomas D. Gray in 1946 and was married for 62 years. He preceded her in death May 16, 2009. Betty is survived by her children, Barb Gray and Michael (Judy) Gray; grandchildren and their spouses, Steve (Kim) Schmidt, Cortney (Keith) Jordan, Darcey (Tony) Sebolt, Marley (Hal) Nerhus; eight great-grandchildren; and one great-great-grandchild. Betty was preceded in death by her parents, husband and siblings. To plant a tree in memory of Betty Gray, please visit our Tribute Store. "Email Address" would like to share the life celebration of Betty Gray. Click on the "link" to go to share a favorite memory or leave a condolence message for the family.